We think of the Bolsheviks as specialist in propaganda, extensively using methods old and new, before and especially after the revolution. Everyone has heard of Agitprop and knows about the posters, the films and even the Agit trains. But as far as the postal system was concerned, the Bolsheviks took several years to even begin to use postage stamps, postal cancellations and postal stationery illustrations for purposes of propaganda. For all practical purposes, post - 1917 Revolution mail looks just like Imperial mail, except dirtier. Aside from the Kerensky Chainbreakers and stationery cards used by the Bolsheviks - and some censorship marks - there is nothing to signal the change of regime until the Arts and Industry stamps appeared in the Autumn of 1921 - and even then not in sufficient quantities for the change to be sustained. Take a look at these covers from 1922. 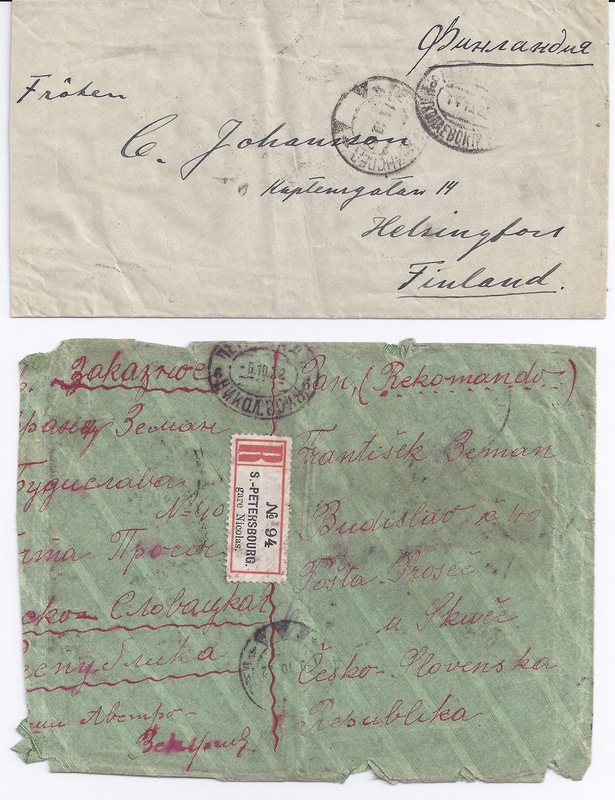 At the top, an ordinary letter to Finland sent from the Nicholas Station in Petrograd on 14 October 1922 - still with that name and still using the oval Imperial cancellation. On the front, only the Soviet Three Triangle censor mark marks this as a distinctively Bolshevik item. The effects of the censorship can be seen on the back, at the right side of the cover. The recipient opened it with scissors, slightly reducing it. But the censors had already been inside, through the triangular flap, damaging the stamps and the tissue paper lining of the envelope. The two Petrograd 1st Exspeditsia cancellations dated 16 10 22 are transit marks applied after the censor's work had been done, though it looks a bit as if they were applied on the right side to cover up the mess left by the censor. Last but not least, the stamps are scarce ones. They are perforated 12.5 not the regular 13.5. 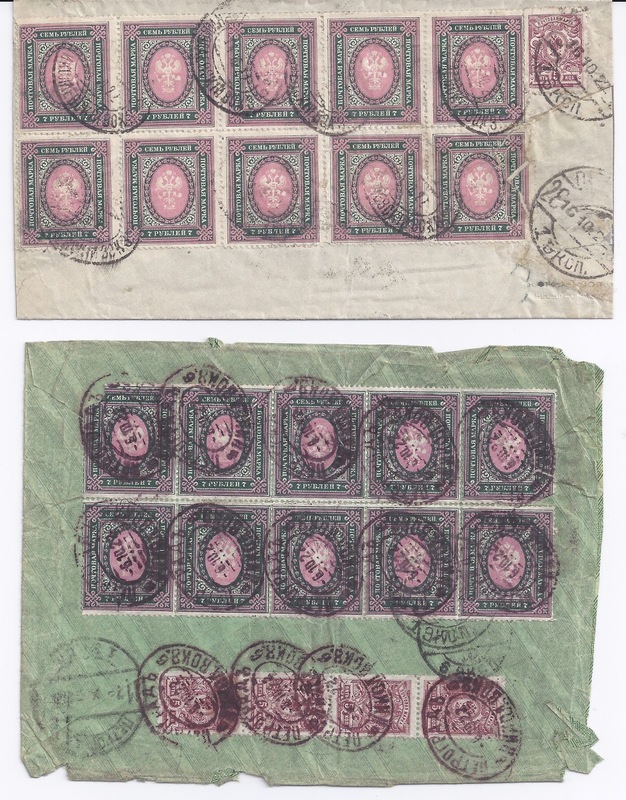 These stamps are from a post - 1917 printing: Michel dates the printing to 1918 and catalogues the stamp at 30 €uro in used condition (Michel 80 C x b II - I think that is what you call a really Unhelpful Numbering System). Now the second cover. This is addressed to Czecholovakia and also starts out from the Nicholas Station in Petrograd but a few months later on 6 10 22 - oval cancellation on the top. The Three Triangle Bolshevik censor mark is at the bottom of the cover dated 9 10 22. But this is a Registered cover, and to indicate that the clerk ahs reached back to pre-1914 times and come up with an R-label inscribed "S. - PETERSBOURG. / gare Nicolas." This use in 1922 of a reminder of the Imperial past is known from other covers - it is hard to find but not impossible. It shows the Bolsheviks as enthusiasts for recycling. On the back we again have a block of 10 of the 7 rouble stamps, but this time with the regular perforation 13. 5. There are transits of the both the 1st and 6th Exspeditsia post offices in Petrograd. I think the censor got in to the envelope at the base, using the flaps on either side of the 5 kopeck stamps. These have been revalued x 100 to make 5 rouble stamps (Revaluation of March 1920) and the total franking of 90 roubles is correct for a Foreign Registered letter according to the Tariff of 17 6 1922. It looks as if the letter was received and opened normally, but there are no receiver cancellations. The only unexplained mark is what looks like a pencilled "6" right in the middle of the front of the envelope.